Oaks Christian School’s Thorson Stadium in Westlake Village, CA. The Matrix® Turf for Lacrosse is a unique sports surface, developed specifically to maximize consistent ground ball performance and playability for all athletes. The artificial turf fibers are thicker and closely hug the infill, giving the players more traction and stability inside the crease and face-off areas, as well as during cuts and fast breaks. 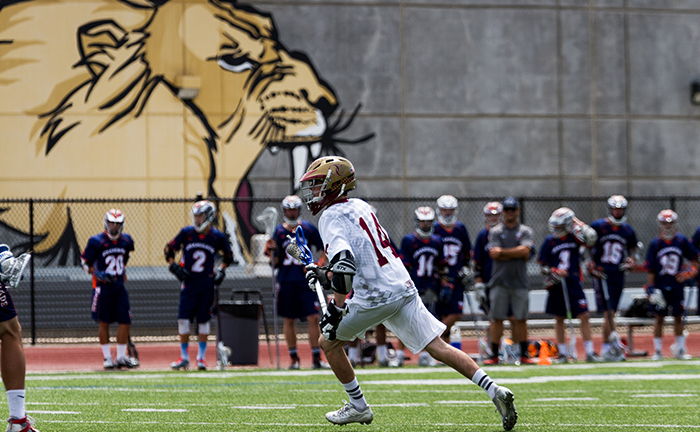 Additional features of the Matrix Turf for Lacrosse include providing a slip-resistant, durable sports surface that allows increased utilization of the field for other events. The Matrix Turf system also results in minimized “fly-out” and splashing, resulting in less downtime due to inclement weather. With the Matrix Turf system, your lacrosse turf is completely customizable. With various pile height, fiber colors, and infill components, each artificial turf surface is planned to meet your exact requirements and needs. Hellas’ lacrosse turfs come in a variety of color options, with options to add logos and specialized colors, ensuring an original and custom field. Before turf installation , each unique option and color combination is thoroughly discussed and carefully selected to ensure complete satisfaction.